Hailakandi ready to launch Pradhan Mantri’s Jan Arogya Yojana (PMJAY) with the rest of country. 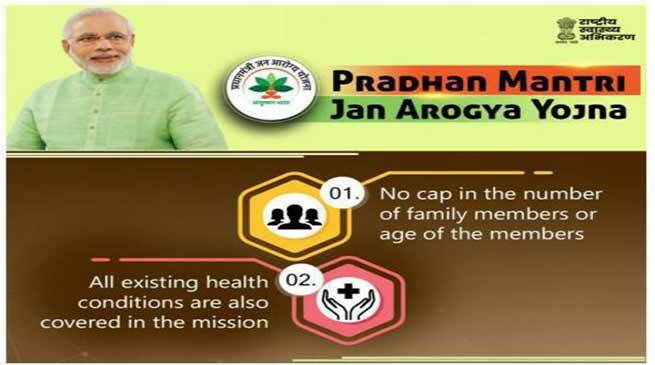 Along with the rest of the state and country, Pradhan Mantri’s Jan Arogya Yojana (PMJAY) will be formally launched in Hailakandi district on September 23. Chairing a meeting at his office conference hall here on Friday, Deputy Commissioner Adil Khan asked the health department to make all out preparations for launching of the programme centrally at Nazrul Sadan auditorium in Hailakandi town on Sunday. Khan directed the Zilla Parishad, Social Welfare, Circle Officers and BDOs to colloborate with the Health department for the formal launching of the programme as well as smooth distribution of health cards to the selected beneficiaries across the district. PMJAY billed as the world’s largest government healthcare programme will ensure an annual health cover of up to Rs.5 lakh to 10.74 crore poor and vulnerable families in the country. In Hailakandi district, 55,736 families out of a total population of 6.59 lakh identified on the basis of Socio-Economic and Caste Census 2011 are eligible for the scheme. The beneficiaries can collect the PMJAY cards from the Gaon Panchayat and BDO offices from September 25 to October 5. Besides Assam, as many as 26 States and Union Territories will join the ambitious health insurance scheme following its launching by Prime Minister Narendra Modi on Sunday.